Richard Ritter was an early innovator of the American "Studio Glass" movement. 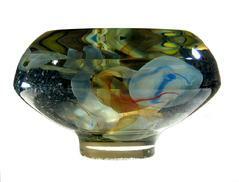 Our piece is a blown, polished and cold worked glass sculpture with added intricate murrini. Vivid colors. Studio Mint condition, with no marks or losses of any kind. As with all hand made glass, there are minor internal character marks, including bubbles, which ensure the individuality of each item. We have available all original papers providing provenance on this item since its 1984 creation; one owner. Signed "Richard Ritter / YC - 23 - 1984"